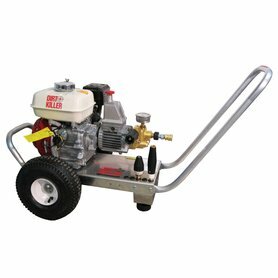 The H357 cold water gas pressure washer, producing 3,000 PSI at 2.5 GPM, is for industrial and commercial use; perfect for the professional who cleans decks, buildings, vehicles, or the fisherman who is cleaning crab pots, fishnets, boats. There are scores of gas powered pressure washers to choose from but the H357 is unique amongst gas pressure washers in four ways. 1) It features the unique German designed KrÃnzle pump that can run dry and bypass better than its rivals, as proven in independent laboratory tests, self primes and is freeze proof. 2) It uses a 5.5 HP Honda LX gear-drive engine that has reduces wear and tear on the pump by 50% while increasing torque and cleaning power. 3) Due to the high strength aluminum frame, the pressure washer only weighs 75 pounds, so one person can easily pick it up, making it easy to transport from job site to job site. 4) The pressure washer includes the Dirt Killer turbo nozzle, that typically cuts cleaning time in half, and the industrial grade KrÃnzle Vario-jet nozzle that combines the function of four flat tip nozzles into one easy-to-use nozzle. The H357 comes with all the accessories you need to clean to include: professional gun-jet lance, 50' wire braided hose with quick coupler connections, exit side chemical injection, gauge, Vario-jet (high pressure wash/soap) nozzle, and a Dirt Killer turbo nozzle. With a cleaning power rating of 7,500 cleaning units, the H357 cold water gas pressure washer provides a lot of cleaning power in a small package. Measures 42-inches length by 22-inches width by 23-inches height. Weight: 80 pounds. Metal finish. Aluminum frame with pneumatic tires - unit weighs only 75 lbs.